We love big beautiful kitchens! This space was designed for the modern family. We added a large island with seating for eating in and for entertaining. The island has storage on the seating side hidden beneath the breakfast bar to add functionality to the space. A solid slab of Cambria made up the countertop for the island. We loved that the shape of the backsplash is emphasized with the light fixtures to keep the space cohesive. Beautiful pendant lights in antique silver finish added interest over the island. A single basin stainless steel apron front sink is both functional and stunning. The shape of the faucet looks great with the sink and in front of the window! Bright white glass tiles in an arabesque shape are one of our favorite design elements of this kitchen! Cambria quartz countertops in Swanbridge add a marble look with all the durability of quartz. We selected JennAir appliances for this kitchen and love the black interior of this refrigerator! A beautiful dark brown hand scraped solid hardwood floor accents the white trim and cabinets and warms up the feeling of the room. 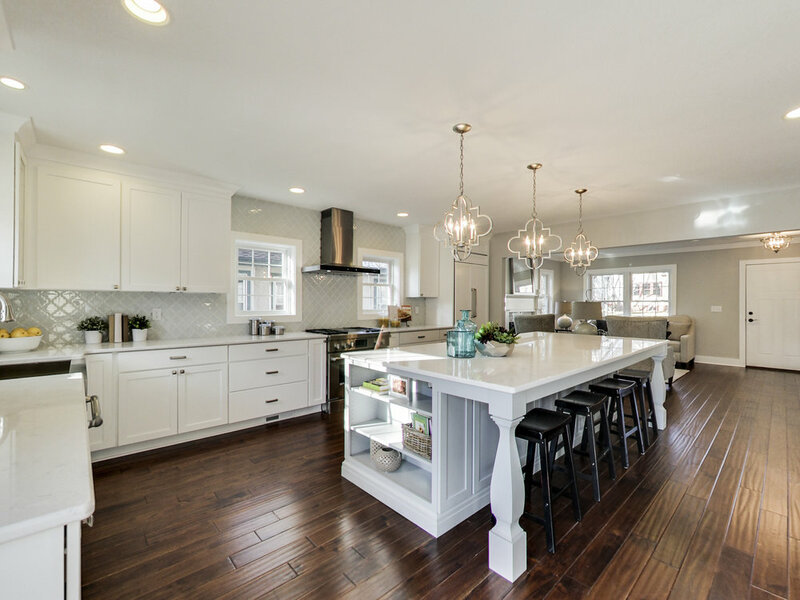 White shaker cabinets keep it classic, light and bright. A gray island offers subtle contrast in the large space.